We’ll give you a free estimate over the phone on our services or rental equipment. For over 30 years, Bert’s Enterprises has served the Greater Victoria Area and the surrounding areas on Vancouver Island with dedicated crane truck, tractor, trailer, and pilot car services. Let us take your next project to new heights with our services in the construction, municipal, and industrial sectors. We also offer loading and unloading services on site and have the equipment to properly and efficiently carry delicate cargo. In over three decades of service, our team has been there, from providing material and operational support to news-making projects, such as lifting totem poles, aquariums, and personal submarines, to rescuing eagles and erecting statues and totem poles within the Greater Victoria area. We’re proud to help on these projects and you can view these articles and more in our Bert’s in the News section. Bert’s Enterprises is always at your service – call us today for a free over-the-phone estimate. We can take care of trucking heavy loads or lifting them. 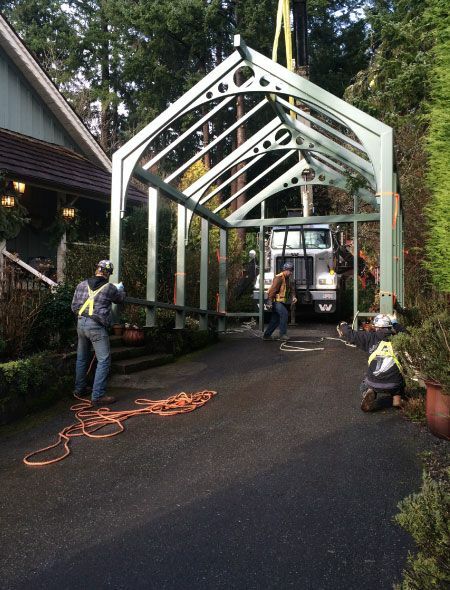 Delivering across Vancouver Island – Loading/Unloading Included. Our team is committed to providing our customers quality service.